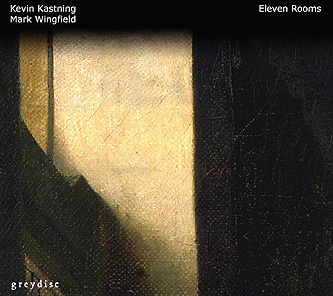 mwe3: Eleven Rooms is the fifth album by Kevin Kastning and Mark Wingfield. When you first met did you think your working relationship would have such long legs? When was Eleven Rooms recorded? I think its your best-performed and best-recorded album yet. Anyway, it sounds great on my vintage gear from the late 1980s and early 90s so I think youve finally bridged that vintage sonic gap with style! Did you set out to record your finest yet? Kevin Kastning: Hi Robert. Mark and I first worked together on the album I walked into the silver darkness, which was recorded in 2010. At the end of those recording sessions, we both agreed that we'd like to do an album project per year, and here we are six years later with the release of our fifth album, with the sixth one in the can. 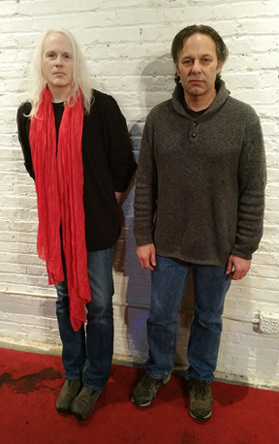 Eleven Rooms was recorded in July 2014. And to answer your other question: every time we're in the studio we set out to record our finest one yet. I think each record of ours has gotten stronger than the one preceding it. Thanks for the kind words about the recording quality. The actual recording sessions were set up about the same as our previous ones. Mark did the mix and mastering, and had some new tools at his disposal, and to my way of hearing, I think this is probably our best-sounding record. He did an outstanding job. Mark Wingfield: I think I knew we would be working together into the future after our first session for our first album. What happened at the first session was for me, totally unique musically and I knew we had just scratched the surface. I think as time has gone on we have gone deeper into what we started on the first album. Thanks for your comments on the recording quality. We do work hard to achieve great quality recordings and I make every effort to preserve or even enhance that during the mixes. A handful of the top software designers have been advancing so much in the past two or three years, to my ears it has at this point surpassed the sound of analog. In fact some of the latest software can go well beyond hardware in terms of enhancing the sound in the very ways hardware is famous for, only without all the compromises and downsides of using hardware. This makes it a lot easier for me when mixing and mastering to get a richer, more organic sound. I think this revolution in audio, in conjunction with the new international loudness normalization standards are going to mean a huge improvement in audio quality and realism. mwe3: Were there any new guitars or recent gear / instruments used during the creation of Eleven Rooms? I want to ask about specific tracks from Eleven Rooms and perhaps Kevin wouldnt mind telling us why he chose what guitar for each track, especially as he has several featured and the mandolin too, which we would also like to hear about. Mark is just listed on the electric guitar here, which will no doubt intrigue fans as to what guitar or guitars hes using. Were you recording direct in or were you using amps on the new CD? Any changes or processes in the recording setup this time around? Kevin Kastning: For Eleven Rooms, we based each piece on a painting by Johannes Vermeer. We did some diagramming and in-depth discussion for each piece. I selected the instrument based on the painting and wanted to match the textures of the instrument and its tuning to each Vermeer. There were a couple of his paintings that seemed to want to be on mandolin, which is an instrument I rarely use in the studio. In fact, I think this is the first time I've used it on a Greydisc recording. Regarding the recording studio, there were no real changes from our usual studio setup. 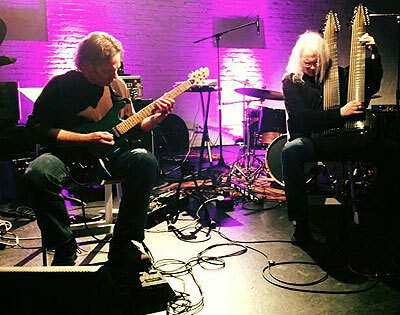 Regarding the instruments I selected for each piece, I used my two main instruments: the 36-string Double Contraguitar, and the 30-string Contra-Alto guitar on most of the album. I used 6-string classical guitar on "A Balance in Light I & II," and mandolin on "The Slumber" and "The Allegory of Painting." I used the instrument that I felt would best capture or illustrate the painting on which the individual piece was based. Mark Wingfield: My setup was the same as previous albums. I was using a Roland VG-88 and a laptop. The VG, which is a guitar processor not a synth, provides the basis of my sound. I then use the laptop to augment that using filters, reverbs and other enhancements. Unlike some of our previous albums, I didn't use any synth or samples on this album. It's all just electric guitar. In fact, what's slightly unusual for me on this album is that on some of the tracks I played with a completely clean guitar sound. It just seemed right for the music and the feeling of the session. My Patrick Eggle LA guitar is the only one I currently use for recordings and live work though I have other guitars I practice on. mwe3: Its interesting that Kevin decided to play the mandolin on Eleven Rooms. What does the mandolin add to the mix and what tracks was the mandolin more featured on? Tell us about the mandolin as you havent used it before on record right? For instance on the first track on the CD, A Letter At A Window: Opening is there a kind of Americana feel to the music? Is that a kind of different sound for you in that Marks electric guitar playing sounds a little different? Kevin Kastning: I did use it on a record project back around 2001 - 2002, but those were radio-only recordings and were never released. For this project, it just seemed to fit a couple of the paintings; it helped to translate what I heard in the paintings. It is a sparser voice with a very limited register. There was certainly one piece, "American Midwest: Touch" about which Mark felt very strongly that to his way of hearing was about the American midwest; hence that title. On the surface, it might seem unrelated to the Vermeer works on the record, but it was recorded at the same sessions and we both felt that it was very connected to the other pieces, so that's why it was included on the album. Mark Wingfield: What I found interesting about this session is that it was inspired by the paintings of the Dutch artist Vermeer. We had books with prints of the paintings open in front of us as we played the session. Yet, as you point out there is a feeling of Americana in some of the tracks. I can't explain that exactly, except that it was just there, it's what I felt in the music during the session. Perhaps it is that some of the things in Vermeer's paintings are universal and so we interpreted them through our own cultural lens and experience. Although I have spent much of my life in the UK, I was born in the US and have spent a significant amount of time there especially in childhood and young adulthood. So a core part of me is and always will be American. Yet at the same time another major part of me is English, I've spend most of my life in England, my wife is English, my mother is English, and my dad is American. For most of the tracks we decided to theme the titles on the paintings which inspired each piece. For track two however, I felt we really needed to depart from that and specify the American feel. Having said that, I think that although the titles are inspired by various Vermeer paintings, in another way they could just as easily relate to scenes of life in American or anywhere else. mwe3: How did it occur to you to include, as influences, the paintings of Johannes Vermeer, who lived in the mid 17th century? What paintings of Vermeer were you most intrigued by and how does his work compare to some of the other influences featured on your other albums? Are the track titles in direct reference to Vermeers paintings and what can you tell us about the cover art? Kevin Kastning: I have been a fan of Vermeer's work for many years. For me, it's not just about what he has painted, but so many of his works seem to illustrate a secret story; it's alluded to, but never blatantly represented. For me, this is really strong and very moving. A couple of years ago, I was reading a book about his paintings and his technique. His control of and use of light in his paintings just knocks me over. The more I looked at his paintings, the more I could start to hear textures in them. I knew I wanted to do a project based on or involving his works. I thought about doing this as an album concept with Mark, and I spoke with him about it and asked if he would be interested in using that as a concept for one of our records. He was very interested in it, so we booked it. A few months before the recording sessions, I suggested we select a handful of Vermeer's paintings that spoke to us, so we agreed on a list of works on which to base our pieces. I then asked him to make a diagram of how he hears various elements in our list of selected paintings, and I did the same. When we arrived in the studio, we compared our diagrams and notes and created a third list, which was the painting elements upon which we'd agreed do translate into compositional elements. We both had books of Vermeer's paintings, so we both had the painting on which we were working in front of us while tape was rolling. Yes, the titles are based on the painting represented by that track. We didn't want to use the exact painting titles, but instead only referred to the actual paintings in the track titles. The cover art is by Vermeer; it is a very tiny detail from, I believe, "The Music Lesson." I loved how it captures his grasp of and use of light; yet it was juxtaposed against a shadow. There are times where I hear the music of Mark and I just like that, and we both agreed that this detail of his painting was a good representation of the overall feel of this record. Mark Wingfield: This was originally Kevin's idea. We have discussed the work of numerous painters over the years and both like a wide range of different genres of painting. We had discussed the Dutch masters on various occasions and both felt a strong resonance between their approach to light, shadow, the inner stories contained in the paintings and our ideas about music. So when Kevin suggested the idea that we use Vermeer's paintings as inspiration for our next album I thought it was a great idea. We usually look for a new approach to each album we do together. Often these ideas are too abstract or difficult to relate directly to the album title or liner notes. However in the case of this album and Dark Sonatas, which was inspired by the composer Eliot Carter, it made sense to explain the inspiration. mwe3: What inspired American Midwest? There seems to be that wide open spaces effect with some great twangy bass notes on Kevins acoustic and Marks fusion guitar sound comes into play. Kevin Kastning: Now I'm not even sure on which Vermeer painting that piece was originally based, but we just followed where it led when we recorded it. During post-production, Mark said he heard a very strong element of the American midwest in it. I am originally from the American midwest; fact, I grew up there, and I knew to what he referred in the piece and I knew what he was hearing in it that had that connection. It is that wide-open spaces element that you're hearing on which the piece is based and why it has that title. Mark Wingfield: This track just went in that direction. For me it was something about what Kevin was playing, the combination of those incredible bass notes, the rhythm and the chords he plays in the higher register. I just saw the western plains, the houses, the back yards, the lives, the distances, and even the cities. So I played what I saw, all those places and lives and the piece just went completely in that direction. That's why I wanted to make the title reflect that, even though it departed from the other titles somewhat. This piece has such a strong and specific feeling to me that I felt it was important that the title had a connection with what the piece was about. mwe3: The Slumber, track 3, is one of the tracks with mandolin. Does the mandolin have a kind pizzicato effect? Is that track a kind of avant garde lullaby as theres a kind a restful effect from the track. Kevin Kastning: That piece was based on a Vermeer painting where a woman is at a table and has fallen asleep. It's a very strong work, and we tried to capture that sense of calm in it. I felt the mandolin brought a kind of delicate austerity and space to the piece. Mark Wingfield: I can see the painting quite clearly when I listen to this piece because I remember very clearly the feeling I got from the painting while playing. As Kevin says, there is such a sense of calm in the painting and at the same time the woman seems to be almost joyous in her sleep or her dreams. That's the feeling I tried to capture and it did become a sort of lullaby. mwe3: What made you decide to make A Letter At A Window into a three part recording? Tracks four A Letter At A Window: Message and five A Letter At A Window: Epilogue feature an extension of Letter At A Window: Opening. How do the three tracks kind of fit together as a trilogy? Is there a meaning behind the 3 titles? Part 3, track 5 has some pretty intense guitars from Mark that dont even sound like guitars. Kevin Kastning: I think the paintings actual title is "Woman In Blue Reading A Letter." We felt that this painting was so strong, both in artistic content and in the secret story element I previously mentioned, that during the recording sessions, we werent sure wed captured what wed intended. We really wanted to try to represent the story, as well as the fantastic sense of light and mood Vermeer established there. So we did more than one version of it, thinking that wed choose the one that came closest to what we wanted for the painting. However, when we heard the rough mixes of all three, it was as if each one contained an element of the painting that the others didnt. So we decided to include all three in the hopes of having our complete interpretation or translation of the painting. 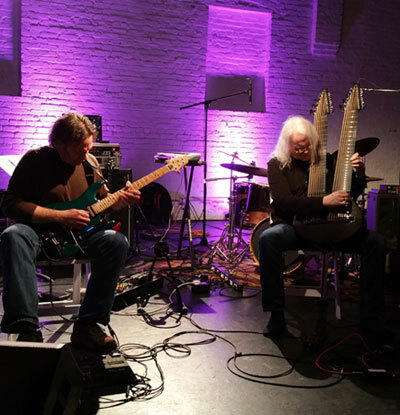 Mark Wingfield: Actually what I'm playing here is just electric guitar played into a long reverb and echo using a volume pedal. I think perhaps the way I'm manipulating the pitch at times makes it sound unusual and less like a normal guitar. These three tracks share the same title because they were inspired by the same painting and they seemed to fit together musically as a trilogy. We didn't have a particular plan to do a trilogy of pieces, but listening back we felt they worked well in that context. mwe3: A Shadow And Folding has two parts that make up tracks 6 and 7. Marks sonic sustainer guitar is very much in control of that track. Whats the inside story of that two part track? Is Mark using any new sound shapers or sonic devices on A Shadow And Folding? Kevin Kastning: I'll defer to Wingfield on this one. Mark Wingfield: A couple of times on this track I did briefly use some sound manipulation on the laptop. I used a wave shaper and frequency modulator, which I can bring in using pedals or the touch strip attached to my guitar. However I only used them momentarily a couple of times on these tracks and very little if at all on the rest of the album. Most of what you hear is actually just my normal guitar sound. What may be different is that I am doing some unusual things with the pitch and vibrato during sustaining notes. Although my usual sound doesnt have that much distortion or overdrive on it, it does have a lot of rich upper harmonics. The particular pattern of upper harmonics in a given guitar sound is something that has always interested me. For readers unfamiliar with what I mean here I'll explain. I'm not talking about playing harmonics on the guitar, I'm referring to the upper harmonic structure of sound. Any instruments sound can be described in part by its unique pattern of harmonic overtones. This pattern of upper harmonics is part of what makes an oboe sound different from a violin or acoustic guitar. Every different guitar sound or guitar tone has a different pattern or signature of harmonic overtones. Even within one particular guitar sound, different parts of the neck will have a different variation of its signature upper harmonic pattern, hence you get different tones playing in different areas of the neck. How you play will also change that tone. Once you have a note sustaining for a period of time, which I do using a sustainer, the note will settle into a version of its particular upper harmonic signature. For me this presents a rich area of expression because if you vary the pitch during this sustain, you also end up varying the harmonic overtones of the sound. This means you can manipulate the tone as well as the pitch. That for me opens up a big area of things which can be done with different vibrato and pitch bending approaches. Because you are altering the tone by what you're doing with the strings, it can in effect become a different guitar sound. mwe3: Track 8 is The Eighth Room. Is that one inspired by a specific Vermeer painting? Thats another very dark sounding track with lots of sustain and some wild guitar freakouts by Mark. Is Kevins role to hold down the fort here so to speak? Do you switch roles on different tracks as to who will be the sonic anchor and who will soar off into the stratosphere? The track does have a great ending with some pizzicato like string effects and Kevins guitar sounds like a tack piano! Kevin Kastning: It was based on one of Vermeer's works, but now I'm not sure which. I don't recall how we set up this piece exactly. Often we will assign roles to ourselves, specify ranges or registers, maybe thematic elements or harmonic elements and base the piece on that. Once we get into the piece, we're not necessarily bound by those guidelines; we just allow the music to come into its own life and take whatever shape and form it wants. In fact, there are pieces where we've agreed upon three or four compositional elements; yet the piece may only utilize one or two of those. The piece itself determines what it wants and needs. Mark Wingfield: We dont tend to specify roles in a piece but we will sometimes specify registers or the change of registers, which we might do on a signal while playing. Often we dont specify anything apart from discussing instrumentation or perhaps tempo. However even if we arrange something like registers, we're as likely as not to abandon the idea at any point during the piece if it feels right. mwe3: What can you tell us about the two part A Balance Of Light 1 and 2? Is that kind of a cooling down after the more spatial elements of the earlier tracks? It almost has a New Age feel to it but I think you guys would probably laugh at anyone using the terms New Age to describe even your more astral moments! 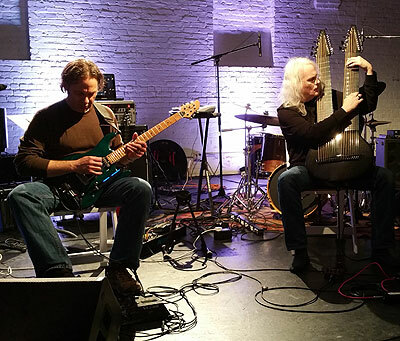 Is New Age music off the map for you or are you too interested in experimental and challenging music to rest on your laurels enough to make a kind of ethereal New Age type album or is anything in the cards? Anyway the two-part A Balance Of Light is quite stately in its own right! Kevin Kastning: I think our music is so difficult to categorize that it may find itself in multiple categories. I don't really mind that; people hear it and define it as they wish, which is probably a good thing. I know that for me, when I can sort of find my own way through a piece of music or a painting and assign my own meanings to it, or allow it to speak to me on its own terms, it becomes a much more personal and profound experience for me. I've heard some really beautiful music that is in the New Age category, so that term or category doesnt bother me in the least. Mark Wingfield: I never think of any of the music I do as being a particular style or not being a particular style. I honestly think of it all as just music. I know that sounds glib, but actually it's exactly how I think about it, what style it might be doesn't come into my mind. I'm happy for listeners to decide for that themselves if they feel inclined to. The music I play and compose might at different times sounds like many things, because that's what comes into my head. we simply let the music develop in the direction we hear and feel at the time. mwe3: Is The Allegory Of Painting kind of the epilogue for Eleven Rooms? Kevins mandolin gives the track a kind of haunting and wistful sound. Is this track a kind of a closing of the doors to the rooms and the paintings or a way to say goodbye after some scintillating sonic conversations? So where to now for you as far as new music and future releases? Tell us about your recent concerts, where did you play and what music are you playing in these late 2015 shows? Kevin Kastning: We didn't intend on it being the final piece when we recorded it. When we heard the rough mixes of everything, it seemed to stand out as having a kind of peaceful finality and closure to it. Nice that you heard it that way, too! 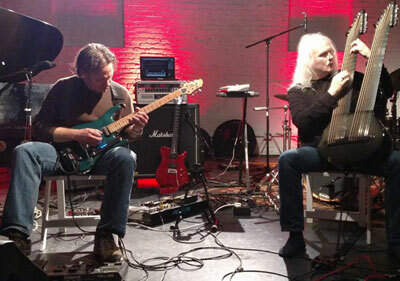 As Mark said, we did a couple of performances in New York City in December 2015, then spent a couple of days in the studio to record our next album which will be out in late 2016. For me, this is going to be a busy year. The new album with Carl Clements is released on January 26. I just sent the masters for my second solo album off to the label; that record will be out in late February 2016. There's a new duo album with Sandor Szabo that will be released this year, and there are a couple of other projects on which I'm working which should also be out this year. There is a trio record in the can of Sandor Szabo, Carl Clements, and me; this will be out in late 2016. The new one with Wingfield will be released also in late 2016. Mark Wingfield: I decided on the running order for this particular album and I felt this was a good ending track, it just seemed to feel right. I'm glad you felt was a good track to end with. 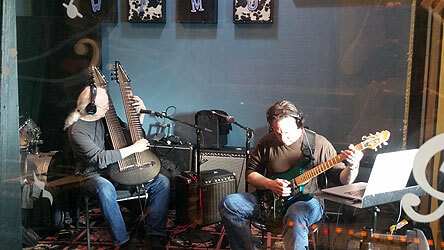 In December we did a couple of concerts in NYC one at Shapeshifter Lab and another live performance on WFMU. Following these performances we went into the studio to record a new album which will be released in 2016. It's a very busy year for me also. I've just finished playing on Dwiki Dharmawan's new album which mixes some of the best of London's jazz players with Dwiki's unique blend of jazz and Indonesian gamalan influences. I'm also mixing Dwiki's album. I am recording a new band album in February with Asaf Sirkis and Yaron Stavi as well as an album with touch guitarist, looper and composer Markus Reuter. I also have a new album with harpsichordist Jane Chapman and Brazilian percussionist Adriano Adewale coming out later this year.